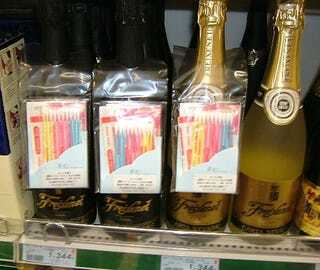 In our ongoing series where we show you bizarre juxtapositions of items from all over the world, the next Weird Combo of the Day fits in well: What better way to get people to buy a bottle of sparkling wine from this Swedish store than to include a package of colorful Q-Tips and a few Band-Aids hung around the bottle's neck? It's time to celebrate! Then let's beat each other up and patch each other up after that! Yeah! C'mon, you're invited to send us a picture of the next Weird Combo of the Day!